Lena sent an email with the picture above, taken in Beijing. “Low carbon” eating – is that a new diet? As all organic matter on Earth is based on carbon it seems like a hard diet to maintain. According to Lena the English skills of Chinese people are not always great. Thus it is likely that what they meant is low carbohydrate. Although who knows for sure? "the “low carbon life” in China. 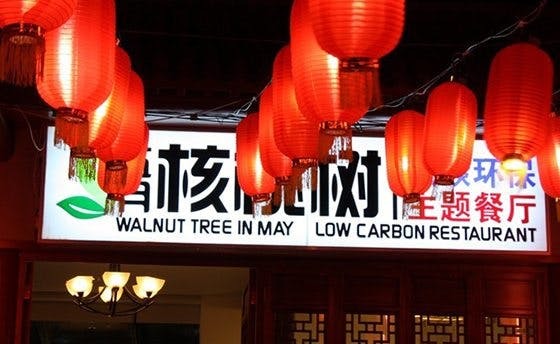 The program explored this new lifestyle through the burgeoning vegetarian restaurant scene in Beijing, and a handful of consumers who claimed to eschew meat out of consideration for the environment. It was a bit narrow in focus but suggested that some people are making this connection, and reducing their meat consumption as a consequence." "What does the green ad say? Beneath the big heart, it reads “Low carbon: best way of life.” On the right, you have a mug of beer, with a suggestion to save 0.2 kg of CO2 by drinking one less; below that a suggestion to save 8.65 kg of CO2 with an energy-efficient electric (rice?) cooker; then to eat 0.5kg less meat with a savings of 0.7kg CO2; and lastly to save 0.46 kg CO2 with 0.5kg less food." I am pretty sure Diane is right about this. They mean "low carbon" as "low environmental impact." Yeah, this is probably NOT an example of oriental English -- or "Engrish" as it is humorously known. In the English-speaking world itself "carbon" has now become something of an "official", albeit scientifically illiterate, shorthand for "carbon dioxide". What is meant is that whatever has been done has not released as much CO2 into the atmosphere as it might have done. They probably mean the restaurant doesn't use solid-fuel stoves or something of that kind. Could this have anything to do with the common misinformation about how much more land it takes to grow the feed for cattle than it does to grown plants for human consumption? Point being that: these figures are based on growing grain to feed cows in CAFOs; instead to letting them feed on pasture as nature intended. I fear that our healthier way of eating is getting caught up in the groundswell of environmental activism. Not that I am denying we need to clean up our act in terms of pollution... I just don't buy the conflation between eating meat and global warming. Yeah, this is a bunch of politically correct socialist cow crap, I'm sure we'll soon be seeing references to the LCEF diet, as in low carbon environmentally friendly.